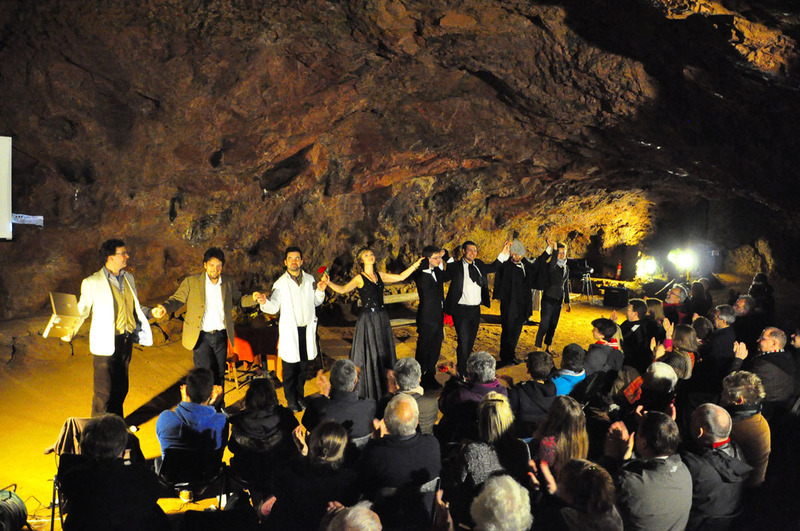 Pop-Up Opera has become known for its lively productions, touring to unusual and out of the way venues. 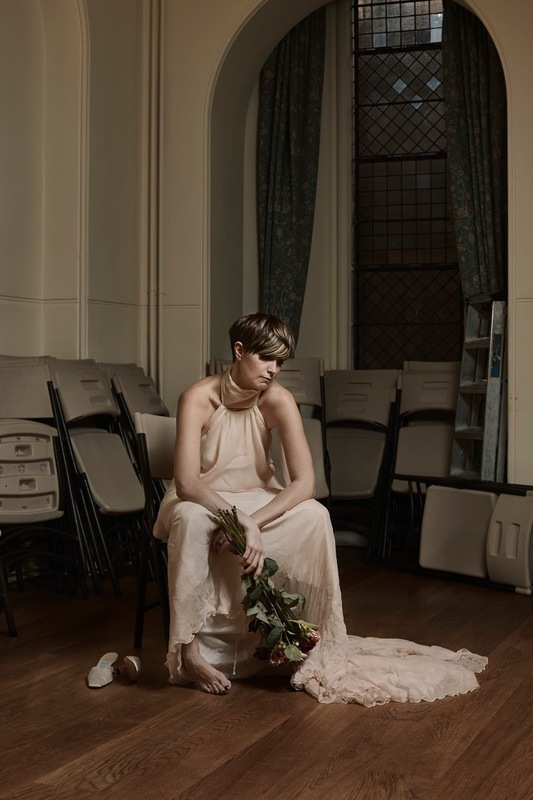 Last year, the company ventured a move away from comedy, with James Hurley's production of Bellini's Capuleti e i Montecchi (see my review) and the production has been revived for the company's Spring 2017 tour. 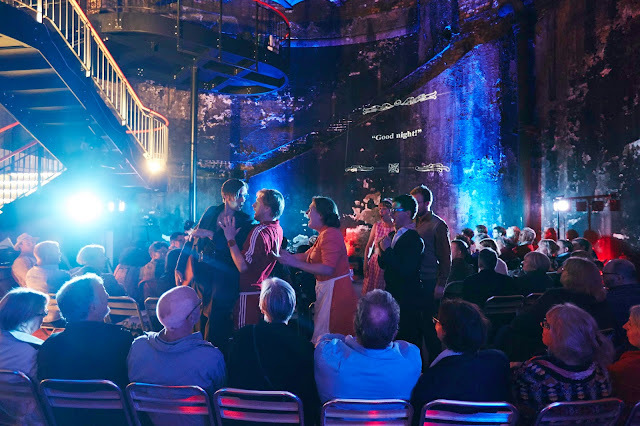 I met up with Pop-Up Opera's founder, soprano Clementine Lovell (Clemmie) to find out more about the company and their plans. Clemmie sees Pop-Up Opera's role as being to bring opera to as many people as possible. She wants to get past the stereo-type that opera is elitist, though she admits that many of the attitudes around opera can be elitist. The company takes opera performances to areas where it is hard to see opera, and many of their audience have not seen an opera before. Clemmie grew up in rural Herefordshire where opera was a rarity, and friends would say that 'opera was not my thing' even though they had never seen one. Clemmie wants Pop-Up Opera to get beyond this. She is influenced by her time living in Italy, when she found the attitudes to opera so very different. There, everyone went to the opera, and opera popped up in opera houses, piazzas, everywhere. And in the opera house there was rustling of papers, chatting to your neighbour about the tenor, whereas in the UK the reverential attitude to opera can be off-putting. So Pop-Up Opera tries to perform opera in a way which will hook people in. The company began by focusing on comedies as a good way to engage people, but from the start they also performed in the original language, rather than in translation. This was deliberate policy, but Clemmie believes that people can be drawn in by the drama and the detail of the staging, as well as the company's signature-way with subtitles. They project subtitles so that they are more like those of a silent movie, and the text captures the essence of the meaning rather than being literal, often with humour and wit. Clemmie see this as putting another layer to the story, but also allows the audience to read into the piece what they want. Of course, working in relatively small venues the singers have to understand and communicate every word. The productions are often very interactive, with intimate venues the action takes place around the audience often interacting with them. The production of Bellini's Capuleti e i Montecchi last Spring was the company's first tragedy. 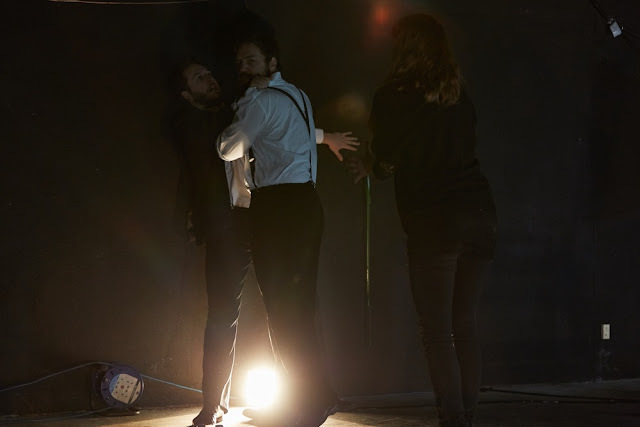 James Hurley's production was immediate and engaging, and it went down well with audiences, Clemmie sees it as giving them a moving and dramatic story which evolves in front of them. So the production is coming back this year, for further performances. The company now gives around 90 performances per year across the UK, and they try to pick venues for each production which suit the atmosphere of the particular production. So, whilst they might perform a comedy in a room above a pub, they would not attempt a tragedy there. Last year Capuleti e i Montecchi was performed in the Brunel tunnel in Rotherhithe, and in the disused chapel at the Asylum in Peckham. This year, the company will be performing Capuleti e i Montecchi in The Vaults underneath Waterloo Station (20 to 23 March 2017). 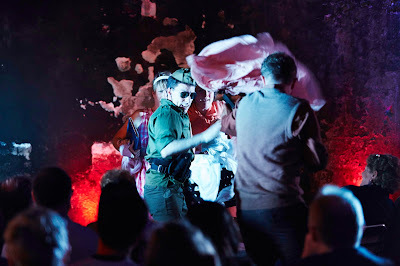 The productions do not have sets, the company creates a set out of the venue so that in a sense each performance is customised for the space in which it is performed. 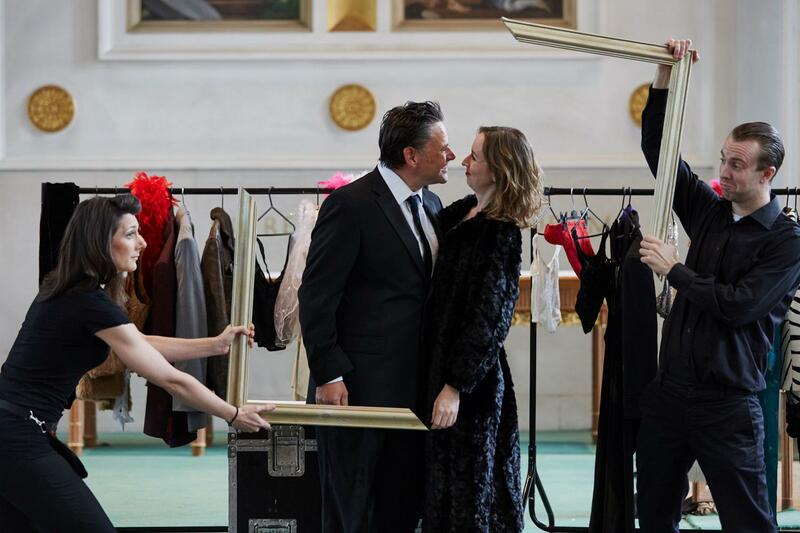 Last year, for the first time, Pop-Up Opera collaborated with a theatre and did a run of performances of Mozart's Le nozze di Figaro at the Kilden Theatre in Kristiansand in Norway, performing with a complete set and an orchestra. It was challenge to make it still a Pop-Up Opera production despite the changes in scale, but Clemmie feels that they were successful and were able to do innovative things with the projection of the subtitles onto the set. It has given the company confidence that they can perform on this larger scale and retain the company's distinctive production style, and Clemmie would like to find a venue in the UK where they could put on the production again. Initially, Clemmie went to venues and tried to convince them to try putting on opera, but for 2017 90% of the venues are either ones where they have performed before or the venue has approached them. But Clemmie is still looking for new and exciting venues. She talks about developing a relationship with a venue, and by returning they are able to develop a relationship with the audience. The company is not publicly funded at all. Their first ever tour was a profit-sharing one to 12 venues, and from there they developed with a business plan and more venues. The company puts its energy into into building the company and relationships with venues, rather than spending time putting together funding proposals. Clemmie admits that it is a challenge, but they are covering their costs. Whilst the company would like to pay the singers more, they do cover accomodation, food and travel and are able to offer singers a lot of performances; it works out at around 20 performances over a few months. Clemmie sees them as offering a platform for young singers, a stepping stone for singers moving away from chorus work but not yet ready for bigger roles in bigger houses. And they now have plenty of singers coming to audition, there were some 400 last year. They try to offer the singers an enjoyable experience; the company has developed a reputation as a nice company to work with. After all, if you are on tour with a small group of people having a good atmosphere helps. They have a nine-seater minibus, and on each day they will drive to the venue, plan the staging in the new space, do the performance and then go to the accommodation, often eating together. Clemmie comments that it can be quite intense. Performing with Pop-Up Opera is a very specific sort of job. Singers have to become accustomed to the audience being so close, and they need singers who are strong vocally with good acting skills, and they cannot hide behind fancy sets and costumes. With the right singers, Clemmie sees the performance as being exciting, rather raw and boiled down. And of course, the singers have to be willing to get into that tour bus, and to perform in diverse venues including a damp cave underground. Sometimes the back-stage area is simply the fire-escape. And for a lot of singers, these challenges are what make the performances exciting and interesting. So far, they have barely experienced the sort of problems with venues arising from the popularity of the video performances from the Met, and Clemmie sees the Met shows as a good thing, encouraging people to try opera. In Summer 2017 they are doing a comedy, but a lesser known one, Cimarosa's Il Matrimonia Segreto which Clemmie feels is a comedy suited to their style. 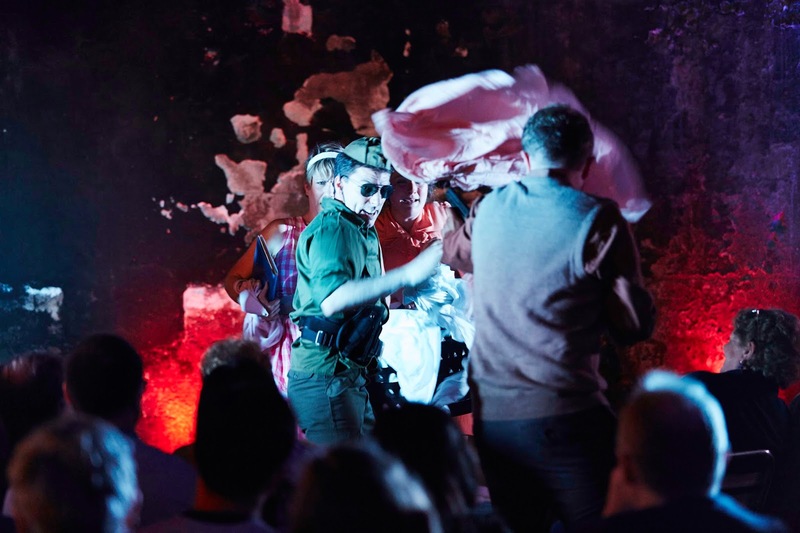 This is being directed by Max Hoehn (winner of the 2015 Independent Opera at Sadler's Wells Fellowship, see my review of his production of Biedermann and the Arsonists) and he is excited by the idea of engaging with an audience in the way of street theatre. Lesser known operas are something of a Pop-Up Opera speciality, in the past they have performed Donizetti's Rita, Pergolesi's La serva padrona, and Bizet's Le docteur miracle. 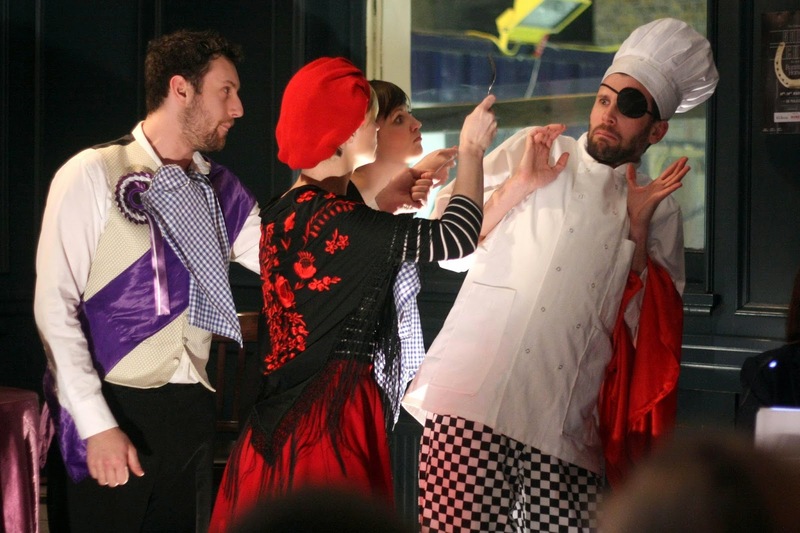 Clemmie feels that they now have a sufficiently developed relationship with their audiences that people will come because it is Pop-Up Opera performing, and that the lesser known operas also pique the interest of regular opera goers. Then in Autumn 2017 the company is venturing another opera which isn't a comedy. Not a tragedy this time, Humperdinck's Hansel and Gretel, it is a piece which Clemmie calls dark and magical. It appeals to her that it is based on a folk story, and that it is such a well-known story means that they are able to reach out to people more. Some venues are excited that they are bringing Hansel and Gretel, though some are wary because it is not a comedy. With any production, there is a restriction on the size of the cast, but Clemmie feels that it is nice to step out of comedy occasionally. Hansel and Gretel is being directed by James Hurley (who directed Capuletti e i Montecchi), this will be his fourth production for them. They have a planned collaboration with the Victoria & Albert Museum, doing performances to coincide with the V&A's opera exhibition. Clemmie does not see the point of performing something for the sake of it, and she is well aware of the potential problems of trying to cast an opera like Verdi's La traviata popular though that may be (and it would also be another opera difficult to perform in that pub). There are, however, quite a few operas the company would like to do, but always they have to keep a wary eye on the cast size (for Le nozze di Figaro in Norway they dropped the character of Barbarina, which required a little careful juggling). Operas on Clemmie's wish-list include Donizetti's Viva la Mamma which is about an opera company, and Cav and Pag. There are quite a few she would love to do, such as Puccini's Gianni Schicchi but whose cast requirement is just too high.